While for many of us, the prospect of seeing new and unusual wildlife is a big part of any trip, getting too close to some of the world’s creatures is something probably best avoided. Although everyone is aware of the danger posed by the likes of sharks, lions and venomous snakes, smaller and less well-known creepy-crawlies can often pose just as much risk. Spiders and scorpions definitely fall into the fascinating but potentially dangerous category and although they are not all deadly to man, it can take an expert to tell “harmful” from “harmless.” Since a bite or sting from an innocuous species can still be excruciatingly painful – and few holiday adventures really benefit much from an impromptu lesson in this sort of practical biology anyway – when it comes to these beasts, discretion is definitely the better part of valour! All spiders are poisonous, but fortunately only a very small number pose any serious threat to man. 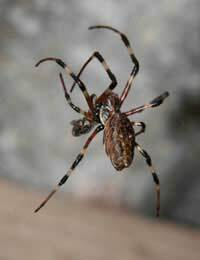 Of these, amongst the best known are the likes of the black widow, banana spiders and North America’s recluse spiders. The true “tarantula” can be encountered in Mediterranean countries – a much less showy beast than the large hairy “bird eating” spiders, often kept by zoos and spider enthusiasts, which are also commonly called by the same name. Spiders are quite difficult to avoid altogether; wherever in the world they occur, they have shown themselves particularly successful at infiltrating and sharing our homes. Whereas even the largest and hairiest of British house spiders is a relatively inoffensive creature, the same cannot be said for many of its relatives which have set themselves up in houses in warmer lands, so it pays to be careful. The most likely hiding spots for many kinds include shady, cool and slightly damp places – the less disturbed by the human occupants the better – so take particular care before poking about in the corners of cupboards or under furniture. Australia’s funnel web and red-back spiders have a particular reputation for lurking under toilet seats, particularly in outside facilities – so a cautious inspection is always recommended before you attend to other matters, however urgent! Outdoors, spiders favour rock crevices, rotting logs, thick vegetation and leaf litter – so exercise a little common sense before sitting down or putting your hands into any of these likely places. Once again, the majority of the world’s scorpions are not deadly, though as with all bites and stings from any kind of creature, even relatively harmless species can cause death if the person stung happens to have a particular allergy to the venom, or is very young or infirm. Scorpions are nocturnal, hiding during the day often under rocks or in vegetation. They may also make use of any other likely looking crevice which offers them the sort of dark conditions they like, making it essential to check cupboards, bedding and discarded clothes or shoes very carefully. Spider bites are usually sharp and needle-like and often accompanied by a burning pain, though for some kinds, it may take half an hour or more for this to develop; scorpion stings are typically painful from the outset. Since the early symptoms of both serious and non-serious bites/stings are generally the same – swelling and soreness around the area, reddening of the skin and numbness or tingling sensations – the safest course of action is to seek medical advice without delay. The guilty animal should be captured or killed, so the doctor can identify what actually did the damage, while ice applied to the wound is a very effective way of dealing with the pain. It is important to stay calm – panicking only makes things worse – and remember that most of these creatures, however scary looking, are not a serious threat to life. Although spiders and scorpions are spread throughout most of the world’s warmer regions, a little understanding of the way they live, coupled with a healthy dose of respect for any you do come across should help make sure your trip remains a happy one.